E601 is a set of equipment units enclosed within a stainless steel cabinet and performing all functions needed for the automated control of a lighthouse or beacon and, for the communication with the remote monitoring and control centre. The actual configuration of the system is to be specified by the customer, as a rule. It is designed for the long-term operation in field conditions. local area network LAN. 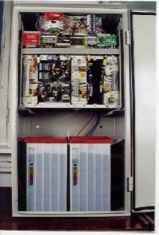 The initial system setup is accomplished using the service computer connected to the system LAN.